Recently, I’ve had the chance to test the FNS-9. Most people are quick to assume that the FNS from FN USA is just a copy of the Glock 19. Well, yes the Glock 19 and the FNS have some similar aspects, but in most ways, they are two different guns. The FNS-9 has the same internal safety mechanisms as a Glock 19: trigger safety, firing pin safety, and drop safety. However, when you’re actually holding the FNS in your hand, you can feel the difference. It may be newer in the pistol market, but the FNS competes against a crowded market of good competition. Is the FNS-9 just a copy of Glock? 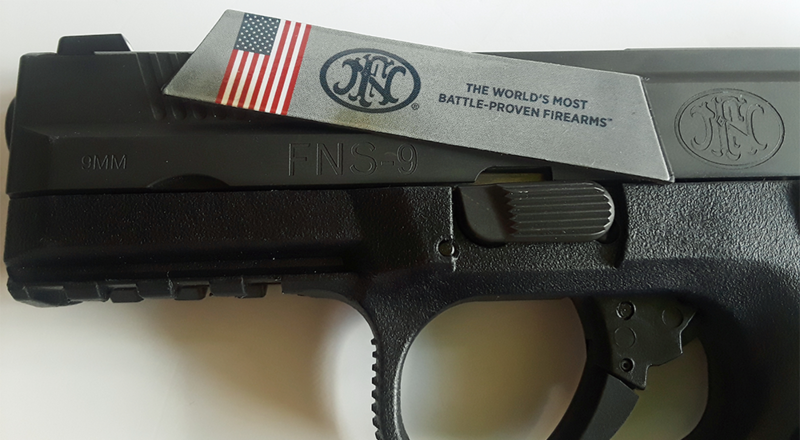 The FNS-9 first launched in early 2016. The FNS is a striker fired, polymer frame pistol. Although it’s roughly the same size as the Glock 19, it feels slimmer than a Glock, which is a plus for those who have smaller hands. It’s compact and with the right holster, you can easily conceal it. This is a well-balanced firearm with a good solid feel. The FNS-9 has a four inch barrel that makes it shorter than the Glock 19. The slide is stainless steel with a black finish coating. The FNS-9 has plenty of stippling on the slide. This helps with the overall control on the FNS and makes holding on quite easy and slide manipulation a breeze. The combination of stippling and pebbling of the grip is especially ideal when firing heavy loads. The FNS slide locks back every single time and locks tight. I know some people have trouble locking a slide back, but I don’t have that problem with the FNS. Since the magazine release and slide stopper mechanisms are accessible from both sides of the firearm, this is an ambidextrous pistol. You can swap hands and still be able to operate this firearm. The magazine release differs a little from most. It is straight but larger than most release buttons while remaining unobtrusive. This larger release allows for a trained user to make a rapid magazine change. The trigger is probably my favorite part of the FNS. The trigger compression is between 5.25 lbs. and 7 lbs. which if you’re use to Glock’s trigger pull, then this is a step up. The trigger pull on the FNS actually feels smoother and not as heavy as the Glock’s. This is a combat-worthy trigger and with enough drills and practice, the FNS trigger can be fast and efficient in rapid moving drills. The FNS-9 comes with the standard three dot sights, but you can attach night sights if needed. The FNS actually has some good accuracy, especially within close range. Whether you’re a beginner shooter or an expert shooter, you can’t go wrong with the FNS-9. Also, there’s no hard recoil when firing the FNS. The FNS-9, like most handguns, can go through a torture test and still work flawlessly. Otherwise, it’s a low maintenance pistol. As long as it’s cleaned regularly and oiled up, it will serve you just fine. 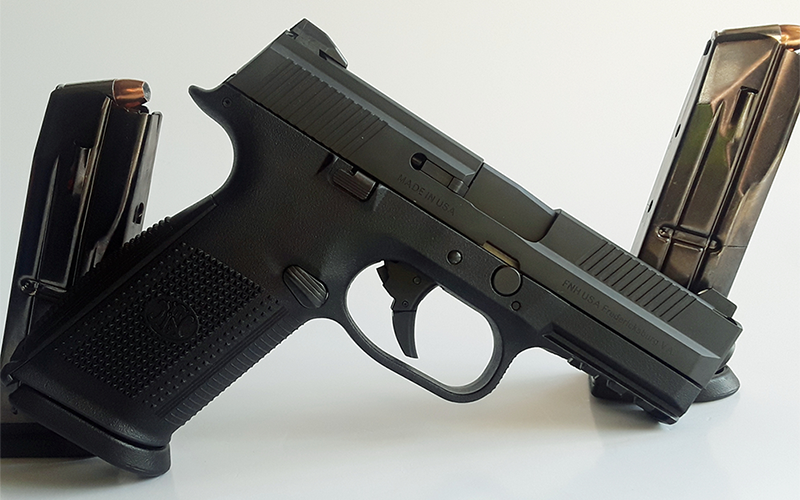 The FNS offers two magazines options: 10 or 17 round mags. A 17 round magazine is a great option, but FN’s magazines can be pricey. The FNS does use 9mm, which is affordable ammunition. This is a plus if you’re filling 17 round magazines. 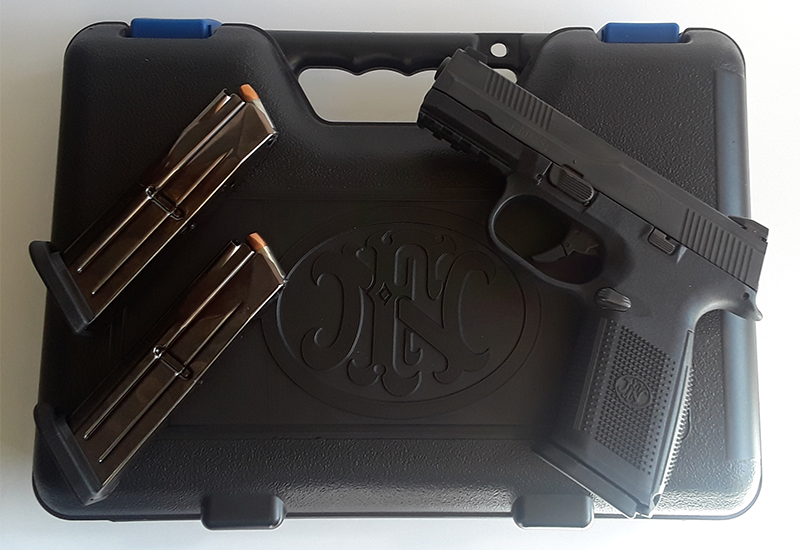 When purchasing the FNS, three metal magazines are included in your plastic lock box. The FNS has a Picatinny rail to attach your lights, lasers or whatever else you need. It is compatible with any accessory you need. The FNS breaks down exactly like SIGs and M&Ps. The nice thing about striker fired guns is that they are simple. As far as holsters, there aren’t as many options compared to Glock or 1911, but they can be found. Some of the best holsters I’ve found for the FNS were Kydex. Holsters of this variety are slim and really comfortable. They offer FNS Kydex holsters for left or right handed or whether you carry in or out of the waistband. I’ve heard that the biggest issue with the FNS is the slide release. People have said that when they slide the rail back, it would get stuck or lockup and it is almost impossible to rerack it. Or others have said that pulling the trigger is the only way to reset the slide, which could lead to a safety issue or accidental misfire. Apparently, the spring in the barrel would get caught and become unable to rack back the slide. I have not faced that problem yet, but I believe FN has addressed and solved the issue. Also, some people have said that the FNS-9 can fit into most Glock 19 holsters. Since I have some Glock 19 holsters laying around, I thought I should test out this theory. The result is no, the FNS is not made to fit into a Glock holster. Again, some people think the FNS is identical to the Glock. The FNS is a little bit slimmer than the Glock so it doesn’t “click” into the holster. It will fit into the holster but it will not truly hold in the holster. The FNS has a big history. The FN company has been manufacturing firearms and rifles since 1889. Fabrique Nationale d’Armes de Guerre (or now known as FN) was originally created to build rifles for the Belgium government. Fabrique Nationale is still producing firearms in Herstal, Belgium but also they have a location is South Carolina, known as Fabrique Nationale America. What some people don’t know is Browning (which are known for their hunting rifles) is a subsidiary of FN. Their website boldly states “The World’s Most Battle-Proven Firearms.” FN supplies the large majority of the U.S. military’s small arms. FN is proud to serve with military and local law enforcement. 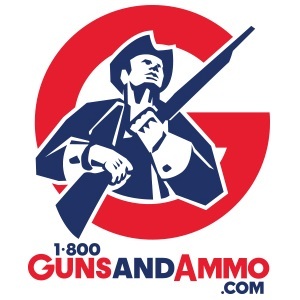 They are a very constitutional company, meaning they proudly stand behind the 2nd Amendment. They encourage civilians to protect themselves and their homes. Every single firearm gets tested by hand before leaving the factory. Also, they fire more rounds during product development than any other firearms company. 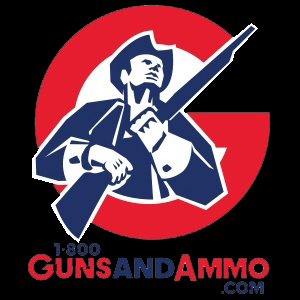 All of their products and firearms are made in the United States. 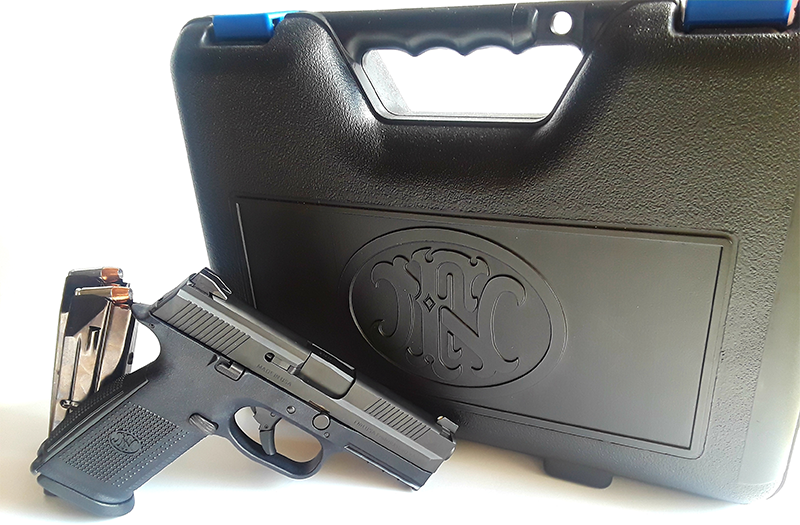 FN stands behind their products with a lifetime warranty for any of their firearms. If you have any issues with their products, they will gladly assist you in any way to make sure you’re ready to get back out in the field. Their customer service helps with performance and safety, including repair services or product alerts. FN has been manufacturing high quality, reliable firearms for military, law enforcement, and citizens worldwide. In the end, the FNS-9 is reliable, accurate, well made, and worth its price. Personally, I like how the FNS-9 is a compact pistol but it just feels comfortable in my hand just like a full size. I would definitely add the FNS to my EDC collection. 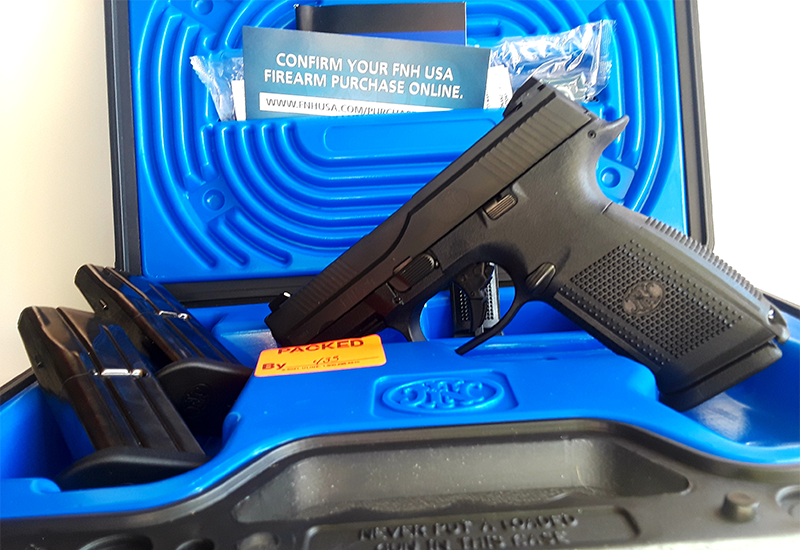 With careful use, regular cleaning, and proper maintenance, you FN firearm should provide you with years of trouble-free service.